There are few who would debate that William Shakespeare is one of the most prolific writers in history. His works have been adapted and poured over for generations; always finding new audiences to rediscover his deep and elegant writing style. Once film was invented it was only natural to bring his works to the silver screen. It was in the mid 1990's that a new way to translate his works was founded. MTV produced an adaption of his classic Romeo & Juliet starring Leonardo DiCaprio and Claire Danes. Its success spawned even further interpretations like 10 things I hate about you which was a modern take on The Taming of the Shrew. Now another of his works has found life on the screen. The Tempest, which was the last of his works written before he died, was about a sorcerer named Prospero who lived on small isle seeking revenge on those who had wronged him. This film changes the male lead to female. The film, which is directed by Julie Taymor, stars Helen Mirren as Prosera, the vengeful sorceress who was once wife to a kind and gentle King. During her wedded years she was freely allowed to practice her art of magic, her only distraction was her infant daughter Miranda. When her husband died however, her brother the Duke (Chris Cooper) took the opportunity to seize control of the kingdom and have her imprisoned as a witch. Lucky for her there were some noble citizens who still looked fondly upon her and assisted in her escape. Prospera and her daughter boarded a small boat which carried them out to sea eventually arriving on a small island. It was only through her mother's knowledge and will that they survived the next twelve years. During that time Prospera planned her revenge, slowly attaining all the knowledge and art she would require to bring justice to those who wronged her. With the help of a playful spirit Prospera unleashes a tempest which causes the ship her brother and his fellows are on to sink. The spirit, Ariel (Ben Whishaw), uses his magic to safely bring the men to shore unharmed though separated. The duke and his friends remain together while the new King's son Ferdinand (Reeve Carney) is marooned on his own. With the help of her spirit Prospera sets forth traps and obstacles to besiege the newcomers and slowly drive them mad. At the same time she organizes a union between Ferdinand and her daughter Miranda (Felicity jones). Through this union and witnessing her daughters innocence and trust toward someone she barely knows forces Prospera to re-examine her feelings of revenge and make a decision towards her enemies. There isn't much we need to say about the performances in this film. Helen Mirren does a fantastic job with the dialogue and the supporting cast,with the exception of Russell Brand, are fantastic. What really hinders this film though is the direction. Taymor seems intent on over compensating for her lack of understanding of Shakespeare by throwing an overabundant amount of special effects at the audience. It is as though she wished to combine the same style of the MTV's Romeo and Juliet with modern day special effects. The film has arrived on Blu-ray and with only one disc to speak of, does contain some interesting extras. Besides the Blu-ray version of the film, which does look superb, you can also have the chance to see the rehearsal footage of Helen Mirren, Dijmon Hounsou, Russell Brand, and Alfred Molina. There is a making of documentary hosted by the director as well as audio commentary from her and a separate commentary from Shakespearean experts Virginia Vaughan & Jonathan Bate. Lastly there is a music video and a rehearsal riff from Russell Brand. Considering this is all on one disc it is impressive to take a behind-the-scenes look at some of the work involved with the film, it is just a shame that the film wasn't as interesting. That is the difficulty when it comes to Shakespeare though, finding the right blend to truly capture his work. 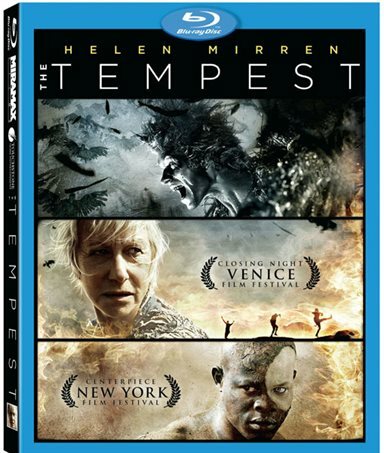 Download The Tempest from the iTunes Store in Digial HD. For more information about The Tempest visit the FlickDirect Movie Database.